Once you have exported a model using a 3D authoring software, you can import it into Harmony and integrate it to set up your 2D animation scene. You have the possibility to convert your 3D models to the *.fbx format upon import to Harmony. This will allow Harmony to render 3D files with the associated textures without the need to copy over the textures manually (as long as the auxiliary files are linked correctly and named appropriately on your disk). 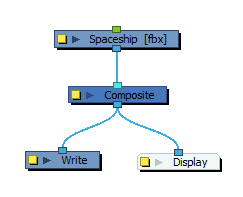 In Harmony, select File > Import > 3D Models. Click Browse and locate your 3D model file. Only *.osb. *.3ds, *.obj, *.fbx, *.abc and *dae file formats are supported. Click Open to validate your choice and close the browsing window. In the Layer section, choose your import options. Create Single Layer Named: Imports all your selected files in the same layer you can name. 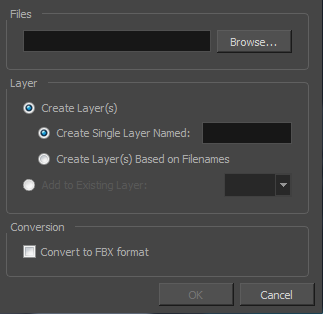 Create Layer(s) Based on Filename: Creates a different layer for each file selected for import. The layers will be automatically named according to the file names. Add to Existing Layer: Imports the selected files into an existing layer in the scene. Use the drop-down menu to select a layer. Note that if you add to an existing vector layer, it will encapsulate the 3D model inside a symbol. In the Conversion section, select the Convert to FBX format option if your file isn't already a *.fbx file and you would like it to be. This format incorporates all associated files, such as the texture files. Click OK to validate your choices and import the selected file(s).